CUPERTINO, Calif.--(BUSINESS WIRE)-- Apple® today updated its iMac® line with up to 8-core Intel 9th-generation processors for the first time and powerful Vega graphics options, delivering dramatic increases in both compute and graphics performance. From consumers to pros alike, users will notice their iMac is faster for everyday tasks all the way up to the most demanding pro workloads. 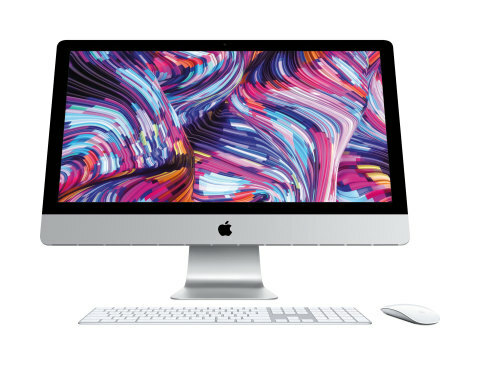 This boost in performance, combined with its gorgeous Retina® display, sleek all-in-one design, quiet operation, fast storage and memory, modern connectivity and macOS® Mojave, makes iMac the world’s best desktop. **Testing conducted by Apple in February 2019 using preproduction�3.2GHz 6-core Intel Core i7-based 21.5-inch iMac systems with�Radeon Pro Vega 20 graphics with 4GB of VRAM and 32GB of�RAM, as well as preproduction 3.6GHz 8-core Intel Core i9-based�27-inch iMac systems with Radeon Pro Vega 48 graphics with 8GB�VRAM and 64GB of RAM; and shipping 3.6GHz quad-core Intel�Core i7-based 21.5-inch iMac systems with Radeon Pro 560�graphics with 4GB VRAM and 32GB of RAM, as well as shipping�4.2GHz quad-core Intel Core i7-based 27-inch iMac systems with�Radeon Pro 580 graphics with 8GB VRAM and 64GB of RAM.�Tested with DaVinci Resolve Studio 15 using 14 common effects�and a 10-second UHD project at 3840 x 2160 resolution and 24�frames per second. Performance tests are conducted using�specific computer systems and reflect the approximate�performance of iMac. © 2019 Apple Inc. All rights reserved. Apple, the Apple logo, iMac, Retina, macOS, FaceTime, Mac, App Store and Apple Store are trademarks of Apple. Other company and product names may be trademarks of their respective owners.